At various occasions in life I have been asked what it was like to be Bo Giertz’s daughter. The implicit reason was that it must have been something special. Those who have asked often did so from either a sense of admiration or repudiation, Bo Giertz was a man who awakened strong emotions for many. I have always found it difficult to give an answer to this question. What does it even mean to be someone’s child? How can a person accurately describe something in a few short statements that are so multifaceted and stretches over such a long time as a child’s relationship to her parents? My answer to the question, in general, has probably been short and dismissive. But I have continued to question, how was it really? What is my picture of dad? How was he as a father? How was he as a person? What was important to him? What did we, his children, see and experience? My picture of my father has naturally been formed in different ways, through expressions of different sources. There are memories of childhood when life was unreflective and dad was simply dad and we were his children. Later, external events, especially the Second World War, gave life wider dimensions and reasons to discover new aspects and features of dad. 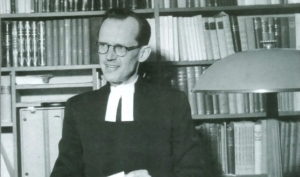 When later as a bishop and courageous leader in church debates, he became a public person who was often the subject of comment from others, I had reason to reflect on both his attitude toward important issues and his way of handling substantial debate and personal attacks. And later I knew him as a beloved grandfather to my children. In our conversations during his last years he looked back (and toward the future, because he always did that!) summarizing and reflecting on what had occurred. Often early memories are colored and reformulated by later experiences. It can be difficult to differentiate between influences from different sources, maybe it isn’t all that important to do so either. When I paint a picture of my dad, it is necessarily with the impressions I have today, built on memories and reflections. I want to stress that this is my picture. We were four children in the family, my older brother Lars Magnus and my younger siblings Ingrid and Martin. Different children in a family have different experiences, and perhaps some have chosen to highlight different matters. Papa was an incredibly stimulating man who was full of life and made life rich for those found in his path. One of my daughters noted at one point that “if I should say something that was characteristic of grandpa, it would be that he had a fantastic joy of life.” That is a good summary. The keynote in his attitude to life was a great joy for life and all the wonder that everyday brought with it, and all the fantastic things there are to discover and learn. He was curious and inquisitive. Whatever it was he was doing, it was natural for him to familiarize himself with it thoroughly. He was thorough and accurate in all he did, if anything deserves to be done, it deserves to be done properly. He had a broad humanist education and a living interest for both history and science. He was humorous and full of a creative imagination. Conversations with him were always enjoyable because of both his incredible knowledge of different subjects and the openness he had for new knowledge and arguments other than his own. He was always prepared to reconsider a position, if he found that there was good reason to do so. In that respect though, he placed high demands. He was uncompromisingly honest intellectually with distinctive demands for truth. He held fast to and acted on what we believed to be true and right regardless of what the consequences might be for him. Papa’s life was full of big and important responsibilities and a lot of work, but this did not hinder him from giving children an important place in his life. Papa loved children, and he loved to play. When I saw him together with my children I could only but wonder if the children didn’t give him a welcome reason to do what he wanted to do, but was otherwise not natural or seen as proper for a man of his age and position. And it could be difficult to determine who had more fun, him or the children! You can find all the parts of this post here as they are released and later in the archives. 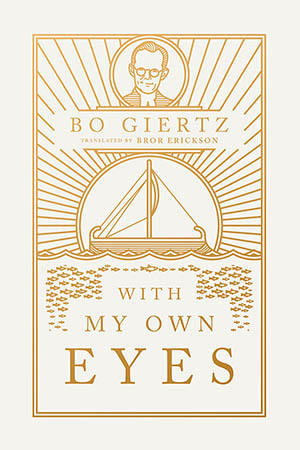 Bror Erickson has also translated Bo Giertz’ With My Own Eyes, which is available now in the 1517 SHOP. The book is a third-person retelling of the Gospels that brings into account various Old Testament references and the contemporary interpretations of those passages by the Jews of Jesus’ day as well as contemporary events throughout the Roman Empire, but most especially those directly affecting the Jewish people of Israel at the time, so that the Gospel stories take on new life and meaning for the reader.